We have been established as a family removal business for well over 100 years. It was the current directors great, great grandfather who founded the removal business together with home deliveries of coal and coke, groceries, drapery and a funeral directors. The business now undertakes exclusively removals to all parts of the UK, Europe and the World. We are Members of the British Association of Removers inland group and as members of Britannia Movers International we are able to offer you a pre-payment guarantee. In addition to being full members of the British Association of Removers (B.A.R. ), Britannia have full accreditation to quality assurance policy BS EN 12522 which demands consistently high quality service and operational standards, which are continually audited by independent quality assessors. Such qualification and membership status gives you confidence that you are dealing with the UK's market leaders in removals. As the UK's largest independent moving group, Britannia has helped tens of thousands of families and individuals move home throughout the UK and Overseas for over twenty five years. All Britannia members are family owned and run companies. 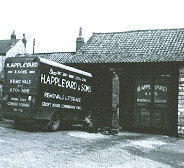 Britannia Appleyards cover most of Yorkshire from Rotherham depot. Although we have the backing from over 50 locations throughout the UK with a combined fleet of more than 400 well equipped vehicles and over 1,000 highly trained and experienced staff you can rest assured that you are also dealing with a local, family firm with a very hands on approach to the day-to-day running of the company, the moves we perform and the clients we work for.